It's a hands-on, active-learning approach to rhythm! 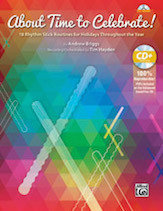 Eighteen familiar songs for holidays throughout the year are presented with notated rhythm patterns and kinesthetic stick routines: tap them on your knees, click them together, cross with a neighbor, and more! The simple rhythms can be learned by rote or read off the reproducible student pages. Plus, concise background information makes it easy to lead a discussion about featured holidays and the history and culture of each piece. Recommended for grades 1--6.